Quirky cool, our Prime Minister loves a zany piece…or two! Theresa May embraces her fashion forward side with an array of pieces that only she could carry off. From a multi pattern plaid Vivienne Westwood for Liberty jacket, to a ruby red spotted wool coat, May is bold, brave and brilliant! 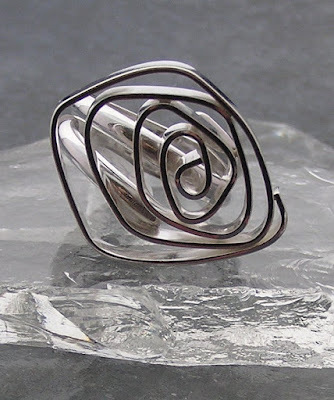 She also has a thing for quirky jewellery, and has been known to rock a Bakelite piece…or two! Glitter studded bangles, old masters screen-printed onto a bracelet and Swarovski sparkly earrings, zany is always in fashion for the PM. And what about those shoes? Multi print kitten heels from the Russell & Bromley/Beverley Feldman back catalogue make regular appearances, as does a pair of leopard print wellingtons. If only we could have a colour clash of prints in the Commons Chamber! Whether she’s addressing MPs or representing the UK on the world stage, Theresa May isn’t afraid to show her personality through her love of fashion. 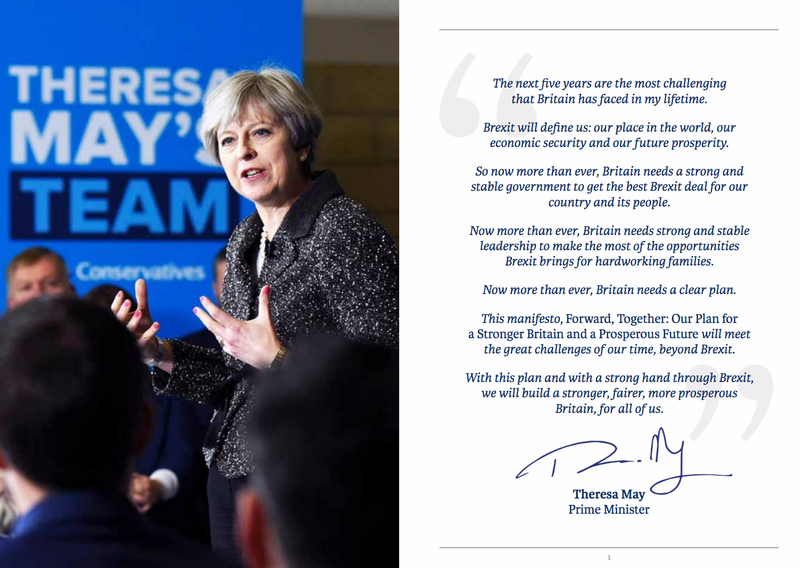 Bright, bold and brand Britain, we’re proud to have such an inspiring and committed woman as our Prime Minister. 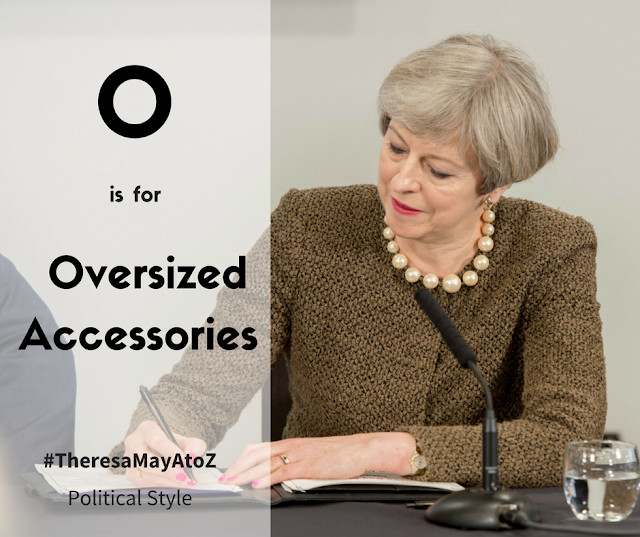 And this marks the end of our Theresa May A-Z series! If only there were more letters in the alphabet! 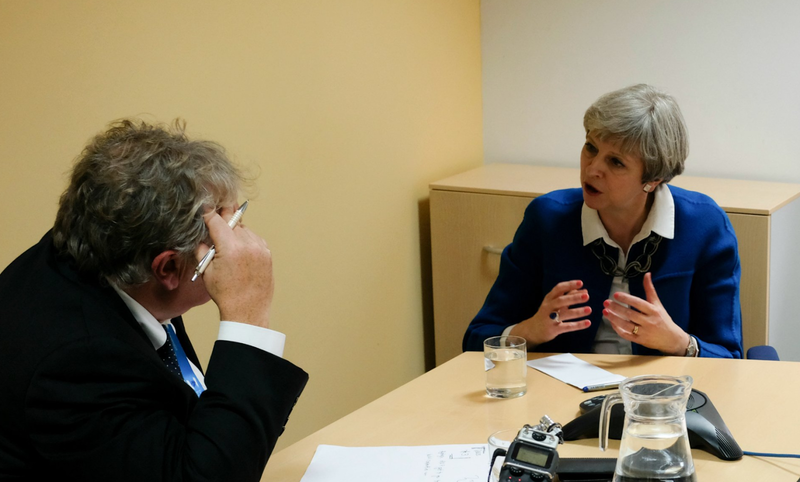 You can catch up with previous posts in the series and other Theresa May reports here. Wearing an eye-catching blue and white scarf to Prime Minister’s Questions on March 1st, all everybody wanted to know was who had designed this masterpiece. The creative brains behind the design turned out to be fashion student Megan Ferris. Studying printed textiles at Winchester School of Art, Megan adopts an experimental approach to her work, using a wide range of materials to create an interesting array of marks. May’s scarf is the Tavira design. 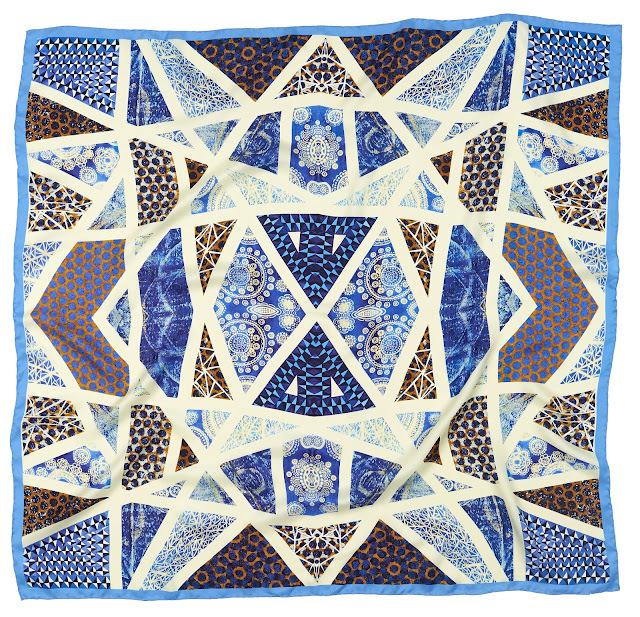 Inspired by the architecture and azulejo tiles from the town of Tavira in Portugal, the decorative hand painted tiles were the stimulus for this striking silk scarf. 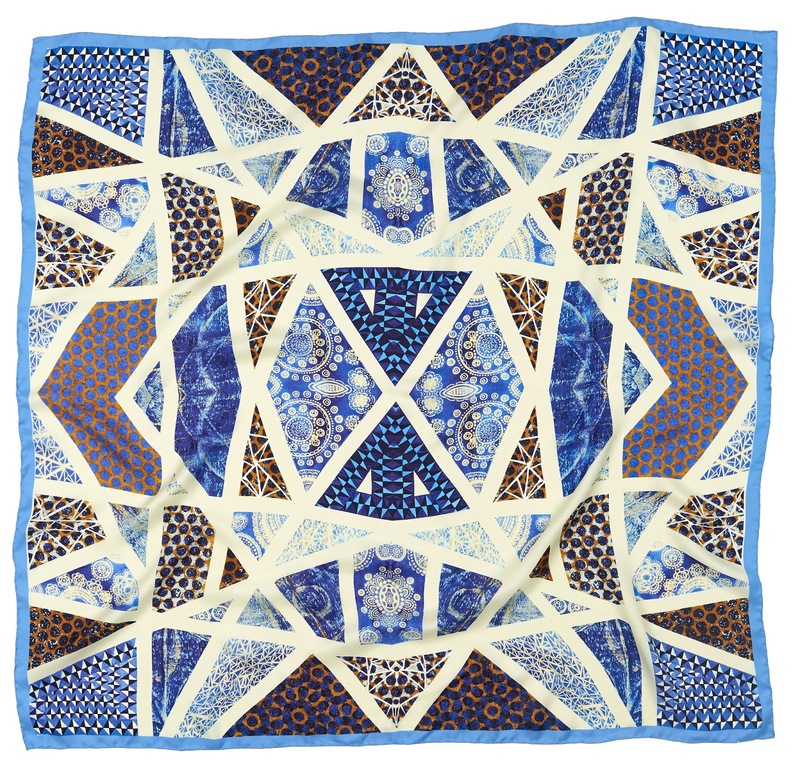 Rolled and edging her Escada navy suit, this fantastic piece is an elegant addition to May’s already fantastic array of scarves. For Ferris, seeing the Prime Minister wear one of her designs was an extraordinary moment. , She shared her feelings with me on a post exclusively for Political Style. What has been the reaction to the PM wearing your scarves? The support from family and friends has been wonderful. 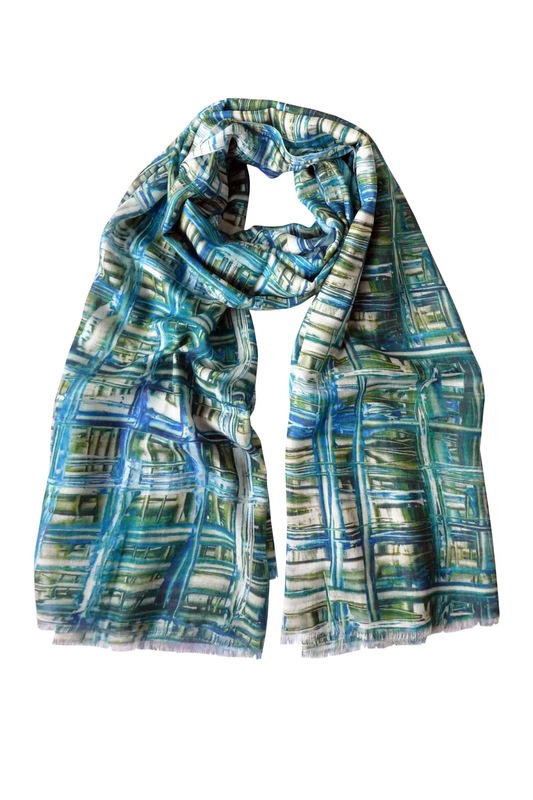 I am rather overwhelmed that Theresa liked my scarf design and I thought she wore it wonderfully. The colours looked excellent on her, it really suited her complexion. 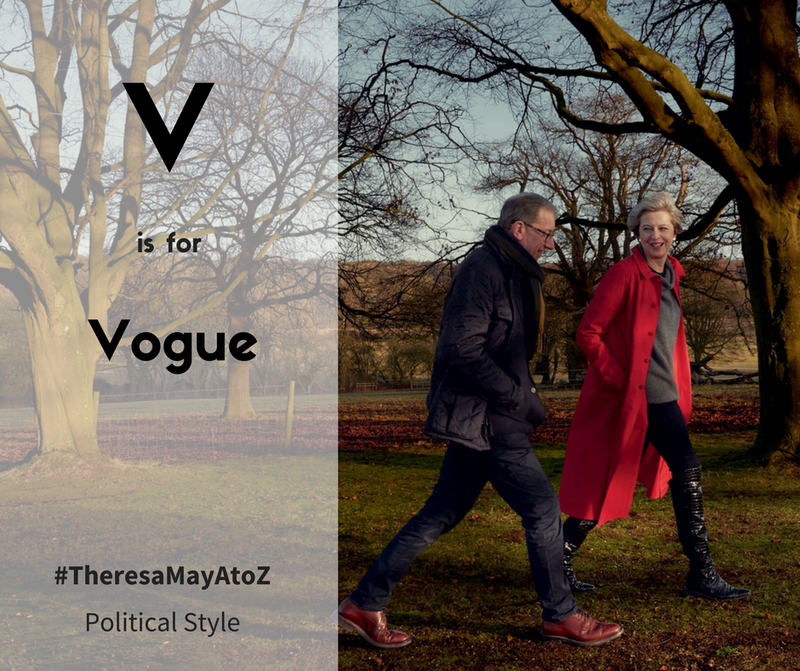 What do you think of the PM’s style and her support of the UK fashion industry? She’s an excellent supporter of British designers and up and coming designers and realises the importance of the British fashion industry to our economy and the many jobs that it provides. She has said she is aiming to lead a government that helps and encourages new and upcoming talent, whatever their background. I think it’s great that she has her own fashion flare. She is particularly good at accessorizing and always adds lovely additions of colour to her outfits. I love her signature kitten heels and she has some fabulous coats. You can read the original post with Megan here. Come back tomorrow for the Z is for... reveal! 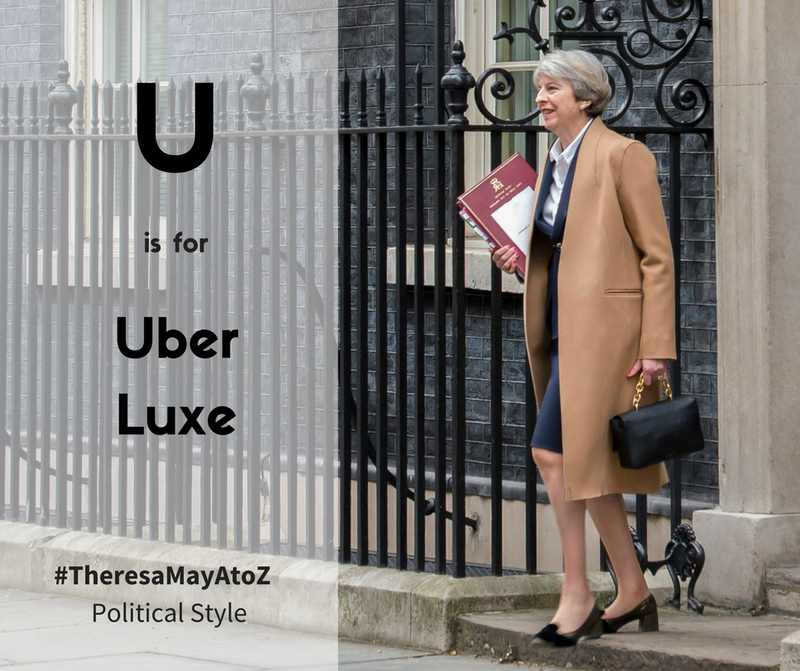 For further A-Z entries and Theresa May posts click here. For those extra special occasions, Theresa May really pushes the boat out. With more black tie functions to attend as Prime Minister, Theresa May turned to old favourites for extra special pieces. 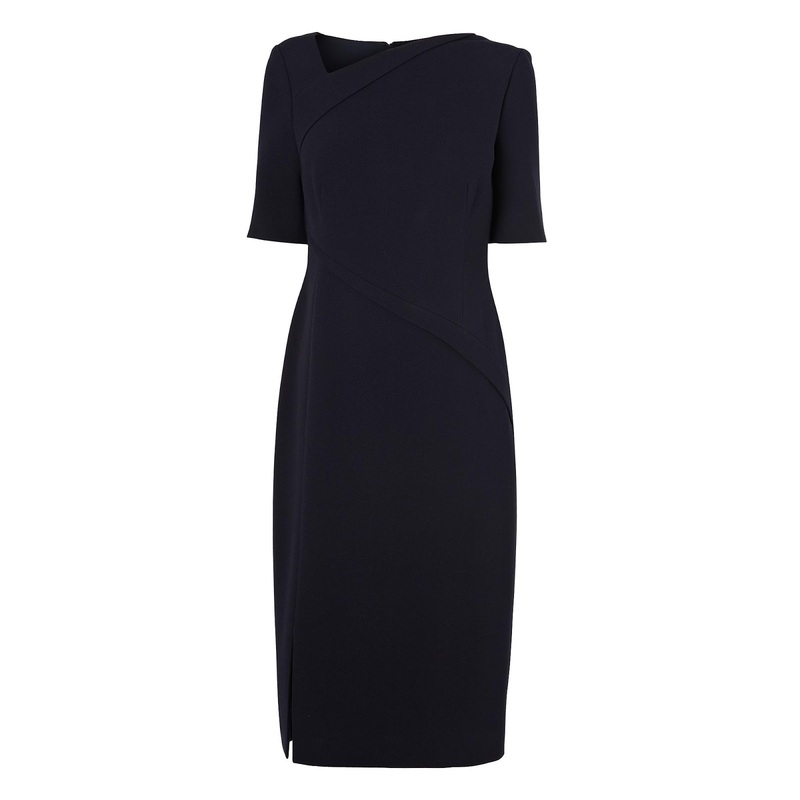 Daring, bold and downright fantastic, May wore the sleeveless midnight Luna dress by Amanda Wakeley to the Pride of Britain Awards in October 2016. Causing a little bit of a media storm, May outshone every celebrity attending the Awards with her A-list dress. Cut off above the knee, the dress exudes femininity, with a deep V cut providing a silhouette that only the bravest would wear. 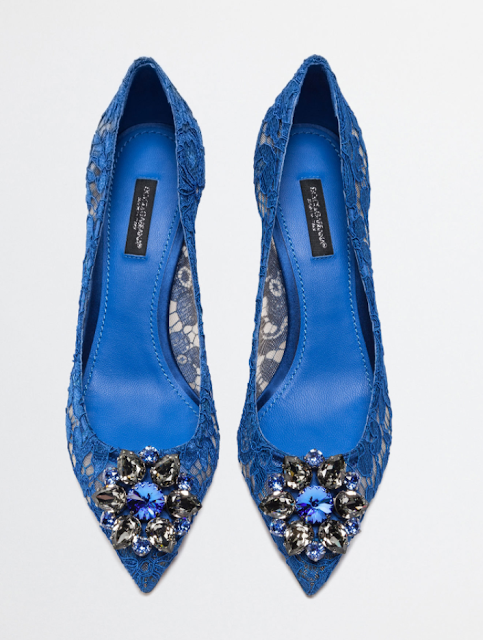 May deviated from her usual shoe provider for this special evening, turning to Dolce & Gabbana for a pair of royal blue Bellucci pumps complete with Swarovski detailing. Very chic! Similarly, May wowed when she addressed the Guildhall in her first Lord Mayor’s Banquet speech in November 2016. Donning a sleeveless slinky red gown, May wore red stiletto heels and a sparkly bangle and Anya Hindmarch clutch bag. A special occasion deserved a special outfit – and May delivered. For other red carpet events May relied on beloved pieces, such as an Amanda Wakeley jersey dress and the same silver lame clutch by Anya Hindmarch. This just goes to show that once you’ve found that extra special item, you’d be silly to let it go! Come back tomorrow for the Y is for... reveal! For further A-Z entries and Theresa May posts click here. 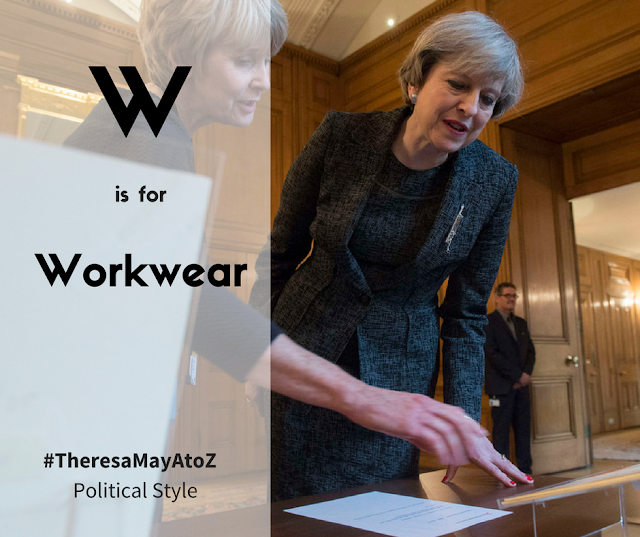 Thanks to Theresa May, your working wardrobe never needs to be boring! Redefining what is acceptable to be worn in the workplace, the Prime Minister shows that you shouldn’t be afraid to throw your personality into your outfit. Much has been made of Theresa May’s work wear look. Some say her skirts are too short, others say she needs tone down her love of block colours. But there is general consensus that the Prime Minister shows that you can have a career and like clothes. Gone are the days where our MPs dressed in a formal manner. I’ll always remember seeing the pictures of Margaret Thatcher in the Commons chamber wearing a hat and gloves- we’ll never see this level of formal dressing ever again! May shows she is not afraid to make a statement, and is inspiring women to do the same. Sales of kitten heels have risen for the first time in decades, and supersized jewels in every high street store. The May effect is clearly powerful, and empowering women across all professions to wear pieces that they love. I’ve never been one to conform to a dress code, but May’s boldness has inspired my own professional look. My leopard flats have become my chosen shoe for new business pitches, and I’ll always try and include a bit of sparkle in my everyday look. For May is redefining what it means to be a professional woman – and a stylish one at that. Come back tomorrow for the X is for... reveal! For further A-Z entries and Theresa May posts click here. A desert island dream came true for Theresa May, when she was photographed for American Vogue’s April 2017 issue. 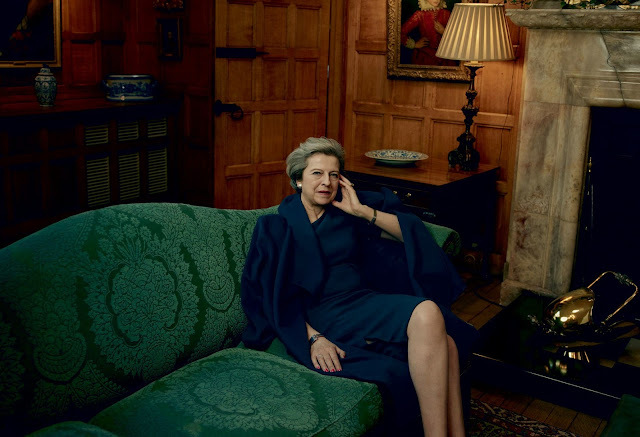 Annie Leibovitz snapped the Prime Minister at Chequers, the official country residence of the Prime Minister. Wearing an all British wardrobe, May chose a navy shift and matching coat from LK Bennett for two photographs in one of the residence’s drawing rooms. For a country walk with husband Philip, May opted for a cashmere jumper and coat from under the radar brand Egg, and a pair of familiar and much-loved black patent croc over the knee boots from Russell & Bromley. The first British Prime Minister to be photographed for Vogue, the shoot has been widely acclaimed and applauded, and the release of the photographs was highly anticipated. It was certainly worth the wait, and for a fashion fan like myself, it's one of my favourite features that the magazine has ran. Come back tomorrow for the W is for... reveal! 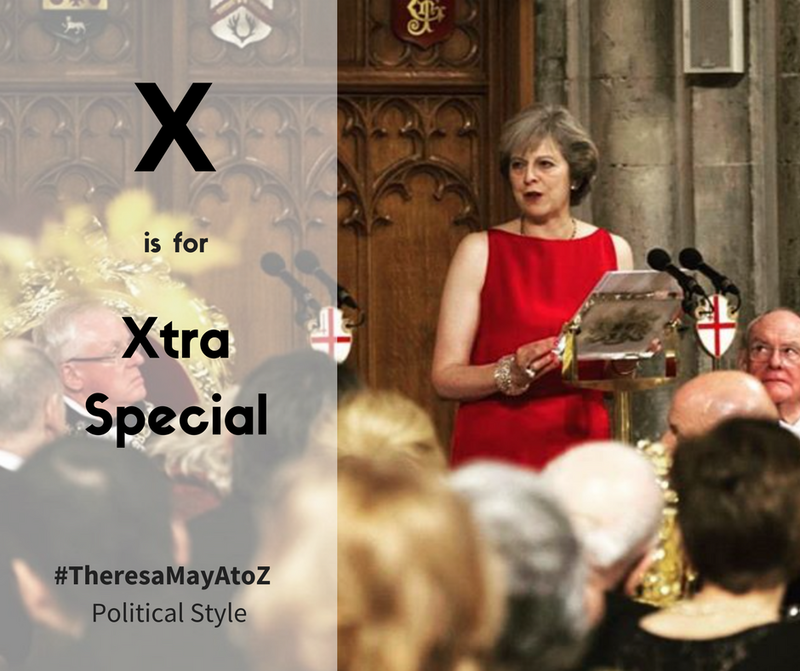 For further A-Z entries and Theresa May posts click here. Our Prime Minister is an uber cool fashionista, with a defined sense of style that we haven’t seen before. But what makes her cool? I particularly like how she constructs outfits, and for me, the way she doesn’t conform to trends, but instead sets them is what makes her an uber interesting politician to watch. May can, for example, take a heavily patterned piece that many might turn away from, and transform it into something which makes everyday fashion a joy to watch. We saw her do this with a bright orange spotted wool coat, teaming it with black patent over the knee boots from Russell & Bromley and boldly wearing it to a State Visit welcome reception at Horse Guards Parade. Epic. Similarly, a black and white abstract patterned zip jacket from Amanda Wakeley is another statement piece that May elegantly wears. Sport luxe in its design, May lets the pattern speak for itself, putting it with smart black trousers- and most recently, the silver toed Charlize loafers from Russell & Bromley. It takes a brave, and cooly confident individual to wear pieces like this- and Theresa May is the perfect person to do so. May knows what she wants, what works for her- and she wears it. She’s unafraid to clash patterns, fabrics and textures- and all in the same showing. Case in point- that neon orange coat, leopard print ankle boots and a metallic black and blue bag from Anya Hindmarch. It’s so out there that it works. Uber chic. Come back tomorrow for the V is for... reveal! For further A-Z entries and Theresa May posts click here. 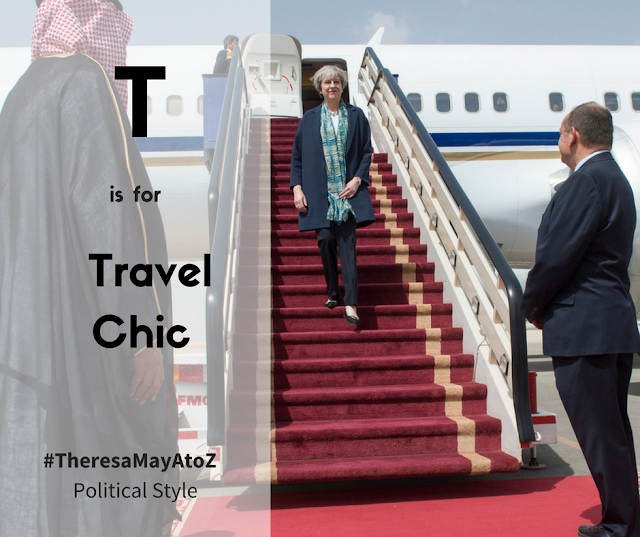 Clocking up the air miles, Theresa May is one stylish traveller. As someone who travels internationally myself, I’m always looking for tips on how I can improve my look when boarding, and how to arrive refreshed and presentable at my destination. May is one chic traveller, with her wardrobe one of elegance and importantly, comfort. Opting for simple outfits, May frequents a staple look of trousers, a shirt or neutral top, paired with a blazer or knitted jacket. Accessorizing with a patterned scarf and minimal jewellery, May adds some personality to her flight with a pair of flats- usually opting for a trusty leopard number or a pair with some added sparkle. If travelling long haul, she’ll change her outfit for arrival, but will stick with her trusted repertoire. It’s familiar, fresh and importantly, fuss-free. Travelling is often long, boring and just part of the routine to get to somewhere much more exciting. I like to surround myself with familiar things, and will pick the pieces that I love the most to give me comfort. May does the same, and we see her repeat pieces from designers like Pazuki and Amanda Wakeley to bring a piece of home with her on the road. May, of course, isn’t travelling on a scheduled flight like us masses, but we can learn from her distinctive and clear look for travel. Hey, it might even get us an upgrade! Come back tomorrow for the U is for... reveal! For further A-Z entries and Theresa May posts click here. Small businesses are the backbone of the British economy, and the Prime Minister is a fierce champion of entrepreneurs in all industries. 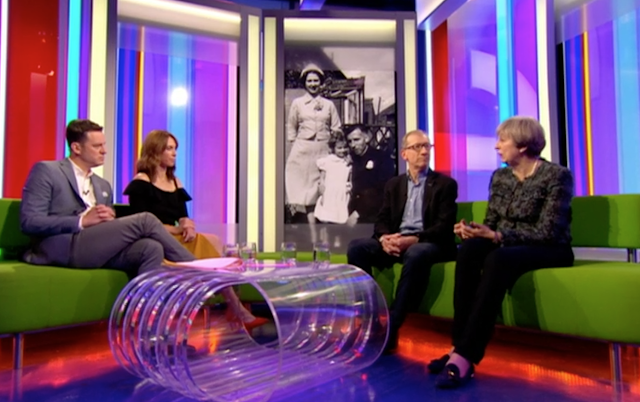 May is a staunch supporter of small fashion brands, and has regularly worn items by forward-thinking designers during her time as Prime Minister. Louison d’or really appeals to Theresa May’s quirky side. Who else could wear a faux fur collar with two flashes of orange and purple to the World Economic Forum? And it is not just on professional trips where the PM champions our small businesses. On a recent holiday and election-deciding trip to North Wales, May visited a craft centre in the village of Dollegau. 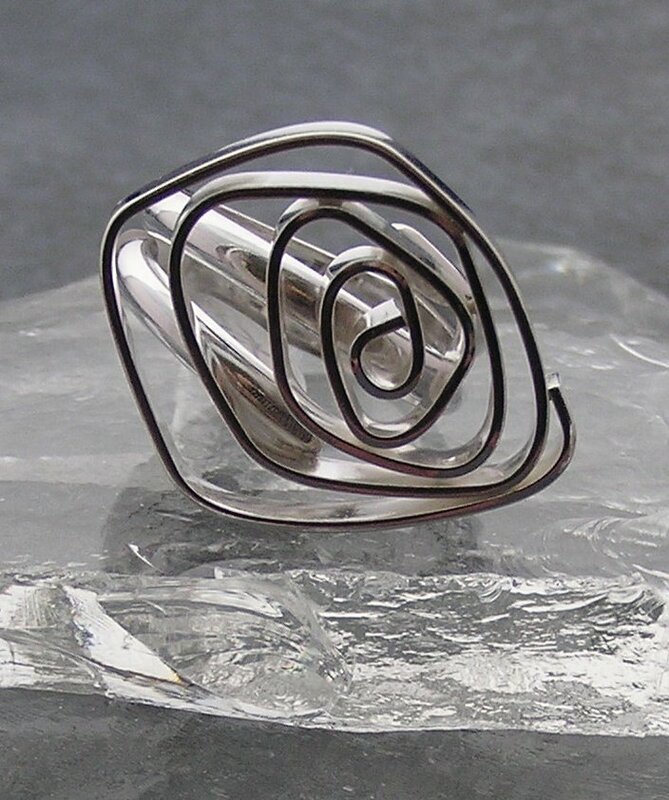 Purchasing a set of Welsh slate coasters and two handmade silver rings by Anna at Celtic Treasure, May reinvested in the small community she was visiting- boosting visitor numbers and sales in the process. It’s perhaps more important than ever to shop local, and with so many fantastic small businesses making their mark on our high streets, it is fantastic to see the Prime Minister practicing what she preaches. Come back tomorrow for the T is for... reveal! For further A-Z entries and Theresa May posts click here. 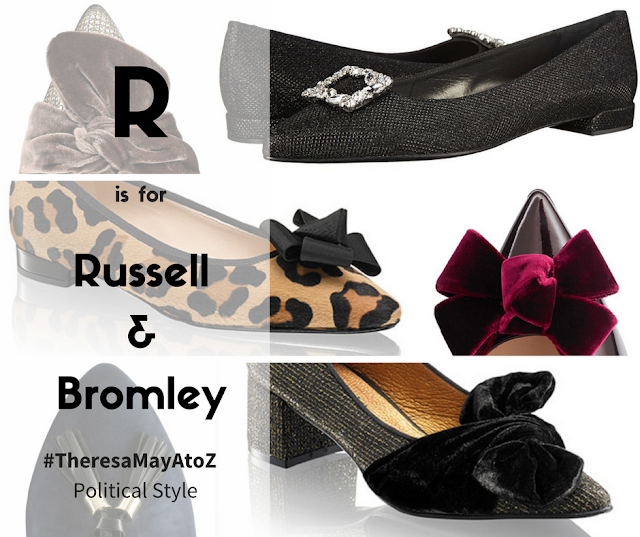 Think Theresa May and you think of Russell & Bromley. Synonymous with the PM’s public image, the legendary retailer has been a much-loved shoe source of Theresa May for many years. It’s hard to determine just how many pairs of Russell & Bromley shoes May owns, but there are at least 50 pairs that I have recognized! 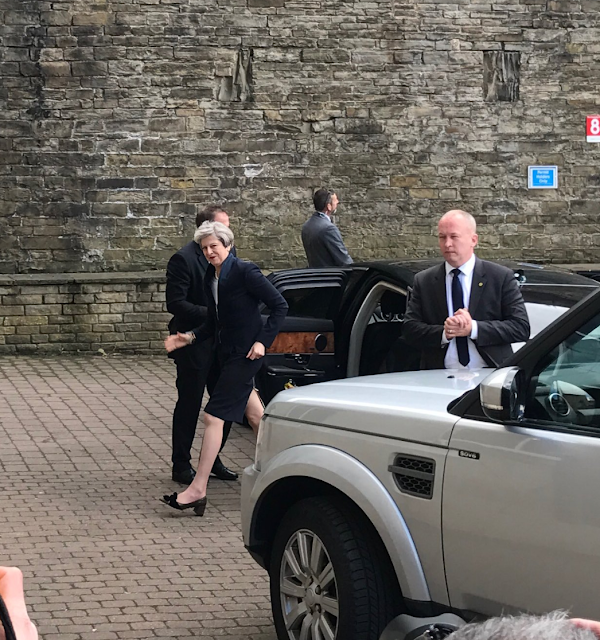 Studded loafers, patent croc over-the-knee boots, embellished block heels, bows on toes, multi-pattern kitten heels and sparkly flats - Theresa May owns them all. 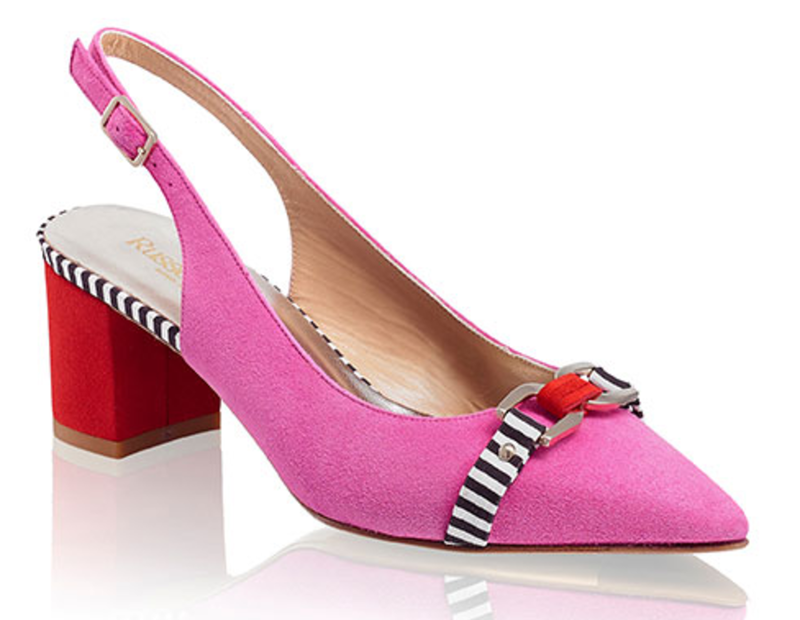 The Link Up slingbacks: perhaps the Prime Minister’s Easter treat to herself, these quirky cool red and pink block heel slingbacks have a striking monochrome trim and snaffle bar detailing. May wore them to the Easter Day service at her local church, freshening up one of her coolest grey tweed skirt suits. 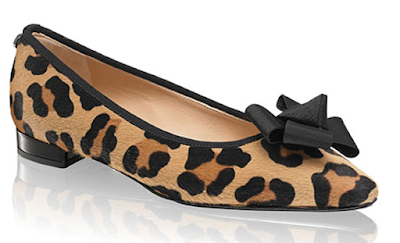 The Delicious flats: a new addition to her stash of beloved leopard print shoes, May wore these grosgrain bow adorned flats on her March trip to the Gulf. And my predictions for the next new shoe debut? I’m hoping for Tiara or Classique! I’ve always said that a good pair of shoes makes a good woman, and with Russell & Bromley as her sole provider, Theresa May won’t put a foot wrong. Come back tomorrow for the S is for... reveal! For further A-Z entries and Theresa May posts click here. 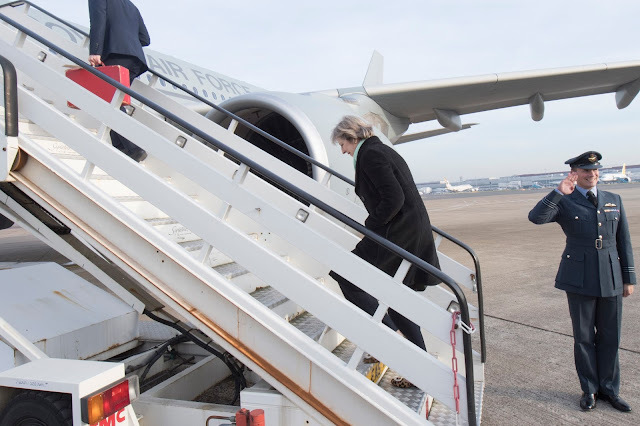 The campaigning continued this week as Theresa May travelled around the country as part of the fight for Downing Street. On Monday, Theresa May visited Tech Pixies in Oxford, social enterprise foundation aiming to return mothers to work. She then returned to London to take part in a live Facebook Q&A with ITV's Robert Peston and answer questions from viewers. It was pretty exciting to hear the Prime Minister answer my question about fashion! For these two appearances, May wore black trousers, the Liberty tartan jacket from Vivienne Westwood and the leopard Cocktail loafers from Russell & Bromley. On Tuesday, May headed to Stoke on Trent, visiting workers at a Screw Fix premises. 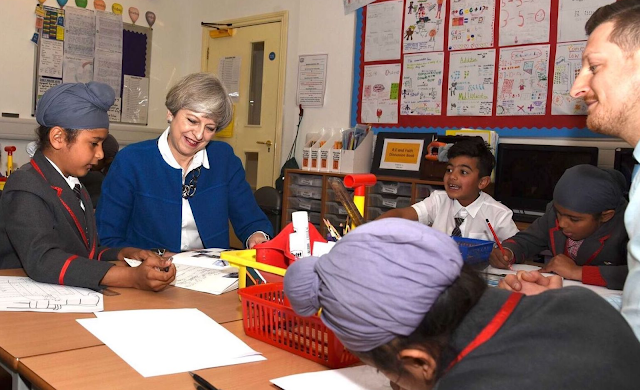 May also visited a Birmingham school and took part in a live town hall phone in. May wore the Samira blue wool jacket from DvF, teamed with a white shirt, black trousers and the Frame leopard flats from Russell & Bromley. She accessorised with an oversized plastic chain necklace and a plastic bangle. On Wednesday, Theresa May held a press conference in London with Chancellor Philip Hammond. May wore a black skirt suit, silk shirt, oversized chain bracelet and necklace from Amanda Wakeley and the Issa x LK Bennett kitten heels. Thursday was the big day- the launch of the Conservative Party manifesto. Held in Halifax, May wore our favourite navy round silk collar suit to the launch, accessorising with a string of pearls and the Twister gold block heels from Russell & Bromley. You can read the manifesto here. 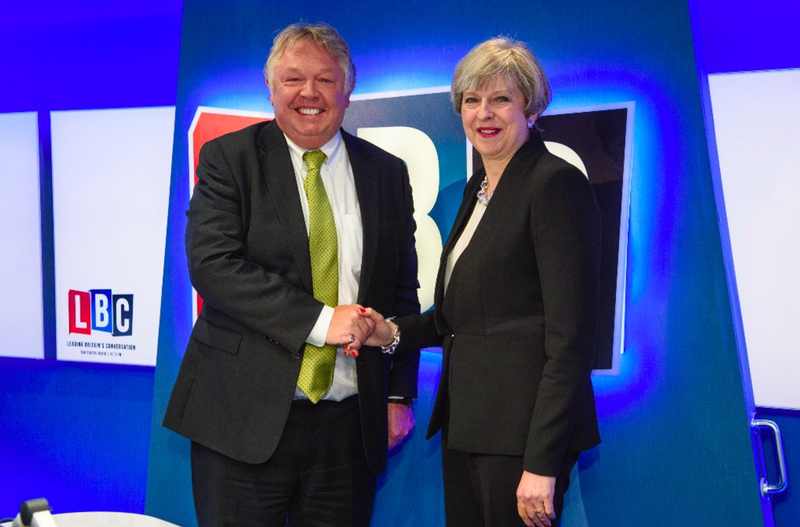 May then visited the MBDA factory in Bolton. 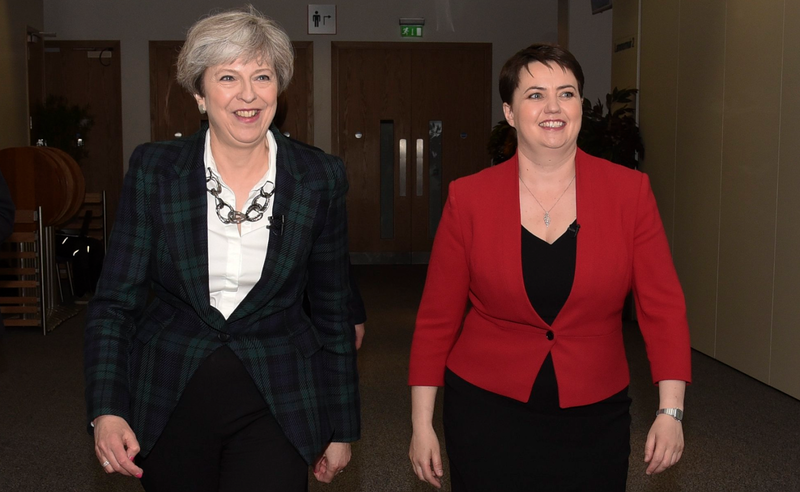 On Friday, the Prime Minister as in Edinburgh for the launch of the Scottish Conservative manifesto. Her customary Blackwatch tartan jacket from Vivienne Westwood made a reappearance, along with a white shirt, black trousers and our new favourite plastic chain necklace. May's studded loafers from Russell & Bromley made a welcome return! Later in the day, May visited Andrew Black Haulage. And on Saturday, May was campaigning in her own constituency of Maidenhead before heading to Ealing and Acton to campaign with candidate Joy Morrissey. May wore a red dress, oatmeal jacket and leopard flats from Russell & Bromley for her visit to Ealing and Acton. 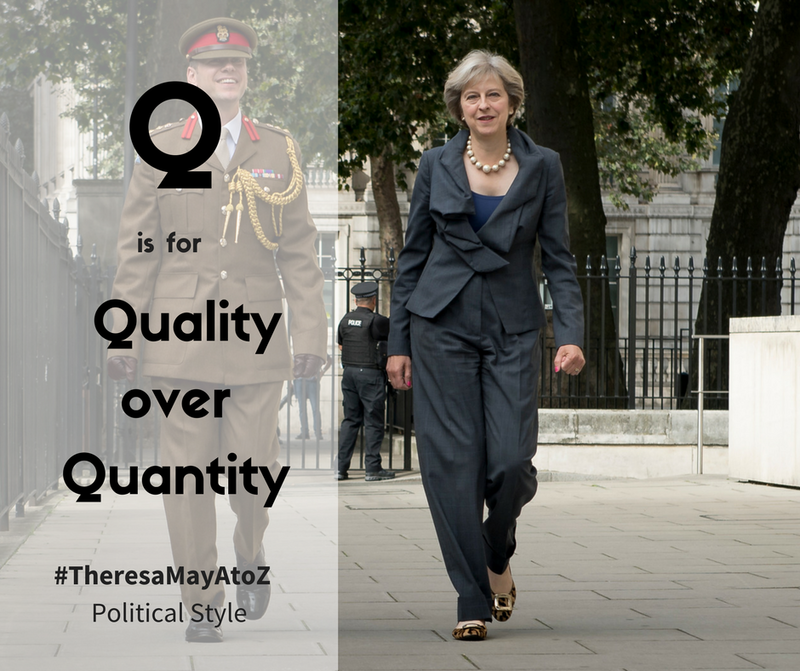 A mantra that fits many of May’s opinions, you won’t see fast fashion in Number 10 Downing Street. Rarely wearing a barrage of pieces all at once, May relies on tried and tested fashion favourites to go about her daily business. 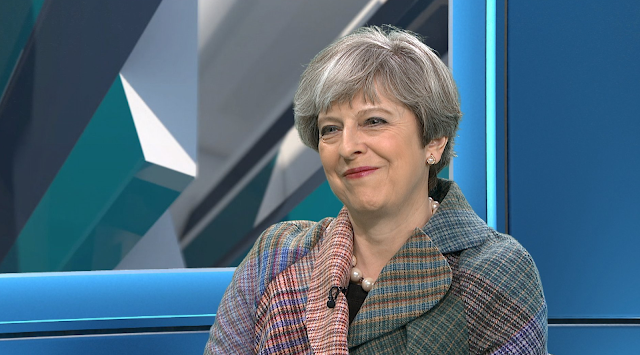 The blazer is a staple in Theresa May’s wardrobe. Owning several in a range of grey, brown and neutral hues, May mixes up her blazer stash, teaming them with dark trousers and a blouse, or opting for a classic white shirt and jeans. She has tweed jackets, boiled wool and cotton, and braided fabric versions, all adding variety and style for her working wardrobe. Similarly, May knows that a good coat will last for years. A navy number with bell shaped sleeves served May well during her time as Home Secretary, and has made a few reappearances since she became Prime Minister. 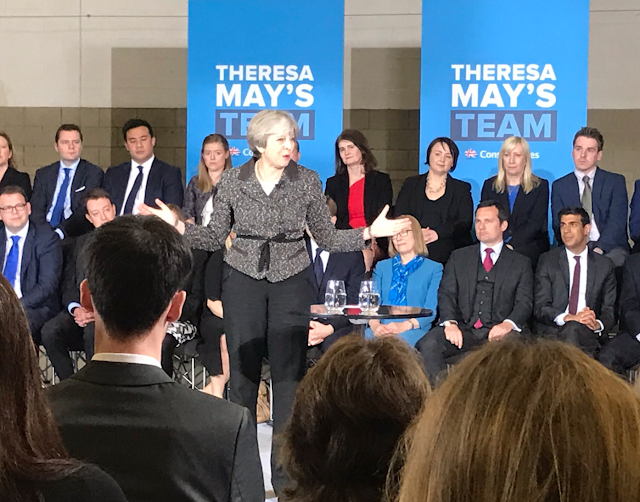 Similarly, a bright red wool coat has also been teamed with a classic navy trouser suit, most recently to the launch of the Conservatives local election campaign. Two recent, quality additions to May’s coat wardrobe are a custom number from Daniel Blake and a camel piece from Amanda Wakeley. Military inspired, the former is a sophisticated black coat with an oversized collar and sophisticated sweeping cut. It’s gorgeous! 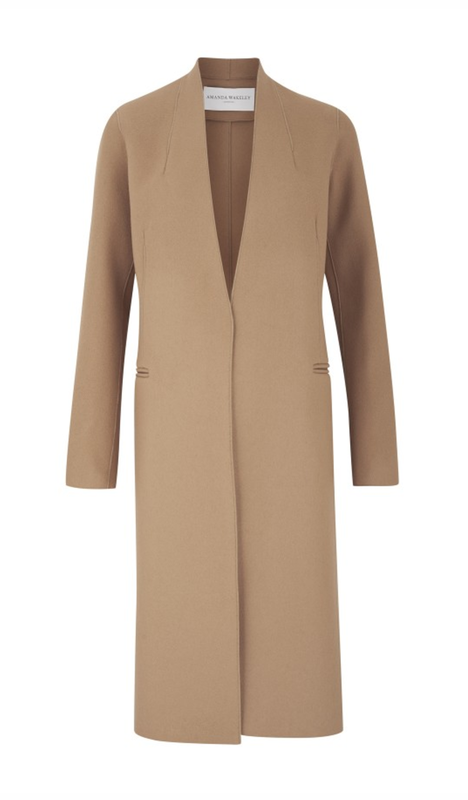 The Wakeley camel coat is cut from a luxe wool blend, with slim pockets and dart detailing, and an invisible fastening. It’s the ultimate in meta-luxury. Turning to accessories, May has a set of quality handbags that she uses on rotation. Totes from Anya Hindmarch and LK Bennett as well as clutches from Amanda Wakeley are some of May’s tried and tested designers. Theresa May knows the benefit of a good tailored piece, and Parisian brand Paule Ka is helping her achieve her super chic look. Celebrating thirty years of business, this brand knows how to design classic pieces with a twist. The French ready-to-wear brand takes its inspiration from the grace and elegance of 50s and 60s style icons like Jacqueline Kennedy, Grace Kelly and Audrey Hepburn, spotlighting strong tailoring and glamorous pieces perfect for the workplace. Whilst May reinvents British politics, she turns to a new take on familiar pieces for her wardrobe. 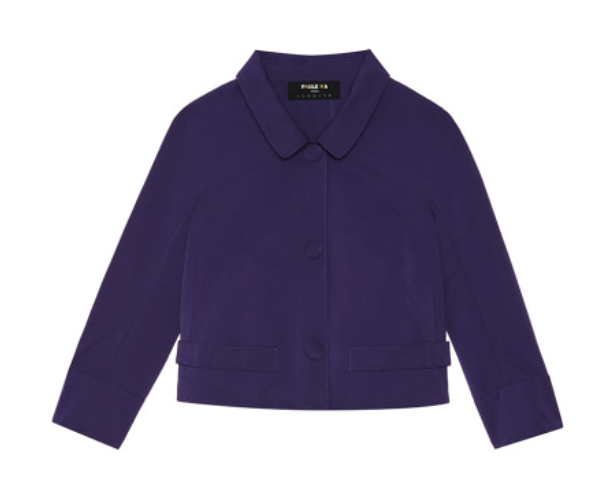 Think the two-piece suit reimagined- a switch from traditional Tory blue to statement violet, a cute back bow detail and oversized buttons. Right up the PM’s street! May also turns to Paule Ka for wildcard items. Opening the Conservative Party conference in October 2016, May looked like a superhero. 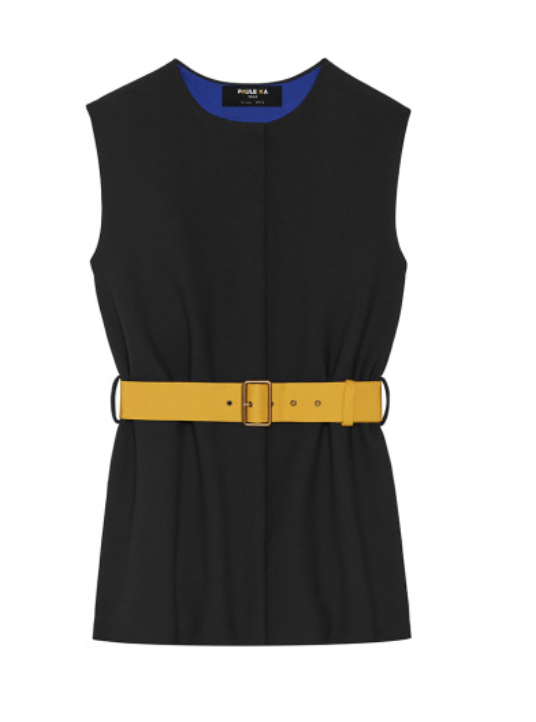 A sharp black tunic was teamed with trousers- and a canary yellow utilitarian style ottoman belt the sole pop of colour. This striking look was thanks to Paule Ka, and it’s up the top of my list as one of the boldest and fierce pieces May has worn during her time as Prime Minister. 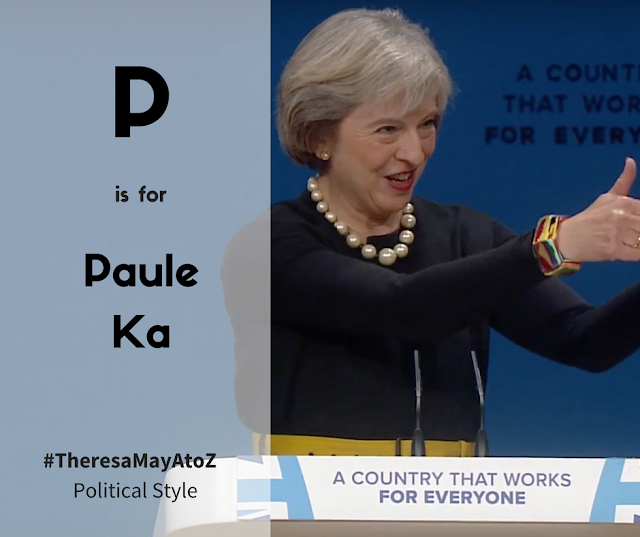 Saving political style one-step at a time, Paule Ka is a fantastic example of Theresa May’s fashion forward thinking and her keen eye for a strong piece. Come back tomorrow for the Q is for... reveal! 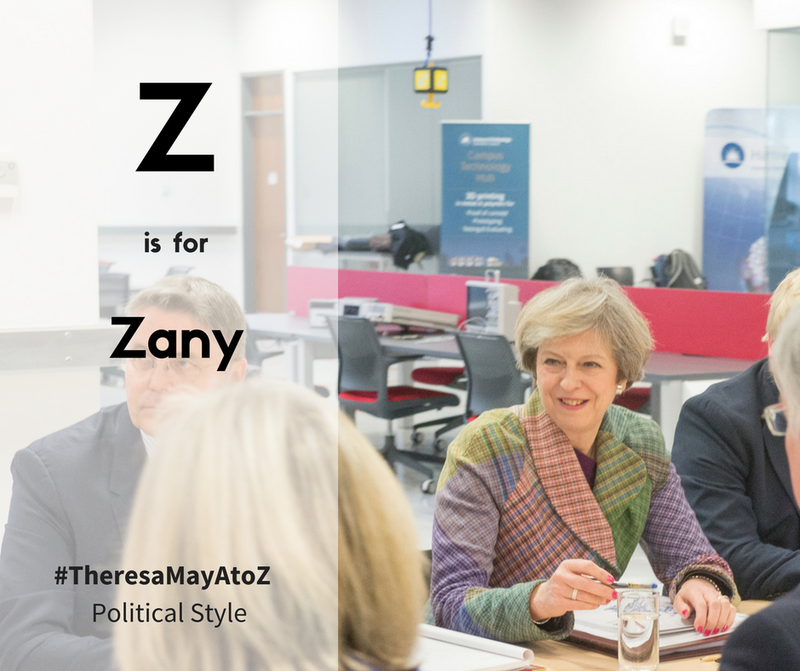 For further A-Z entries and Theresa May posts click here. Go big or go home! Theresa May is a pro at rocking an oversized accessory. With an impressive collection of necklaces, bracelets, earrings and rings, the PM mixes up her work wear look with many statement, oversized pieces. 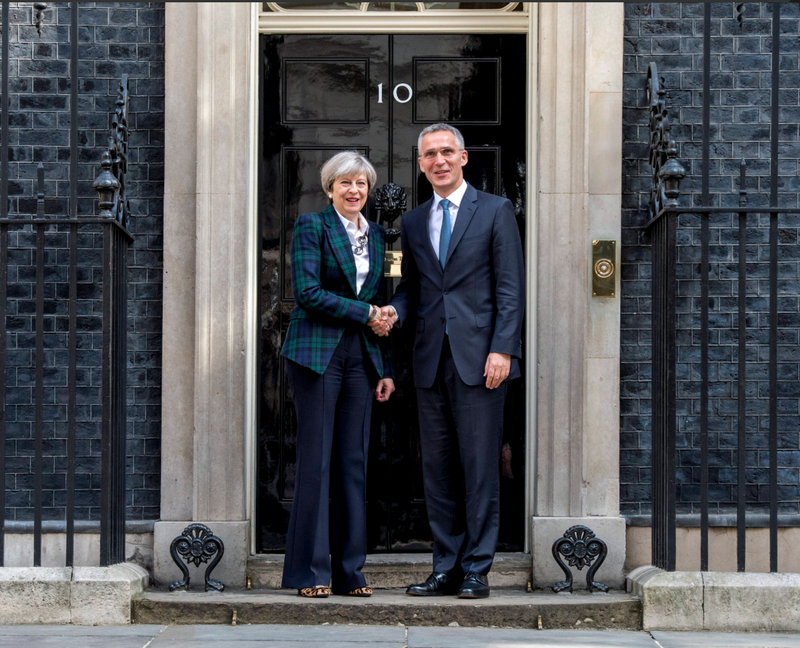 Jazzing up an every day navy suit, Theresa May usually sports a bubblegum sized string of oversized pearls, wearing them to PMQs and official functions. Similarly, the PM wears a gorgeous strand of mixed coloured pearls, all slightly large in size. Two of May’s most popular and most worn oversized accessories are necklaces. The chunky silver chain and matching bracelet from Amanda Wakeley sold out soon after May wore them on the steps of Downing Street in July 2016. Repeat performances at PMQs and foreign visits made the set a must-own item – and they’re back in stock! May’s other oversized necklace is the blue Balls piece from Mirta Bijoux. The star of the Cabinet’s official photo, the necklace is often worn by May with a sky blue coat and navy shift. A friend recently met the Prime Minister and helpfully studied her jewellery for me! May’s large, rectangular bangles, depicting famous art prints and abstract patterns appear to be made of Bakelite or a similar material. These appear to be one of her favourite accessories, wearing a patterned bracelet in her official Prime Ministerial portrait and on numerous public appearances. Not many people could wear such striking jewellery in a confident and chic way, but I could think of no one else who could carry off oversized pieces so well! Come back tomorrow for the P is for... reveal! For further A-Z entries and Theresa May posts click here. Very much a black and white person, Theresa May also favours netural tones in her working wardrobe. 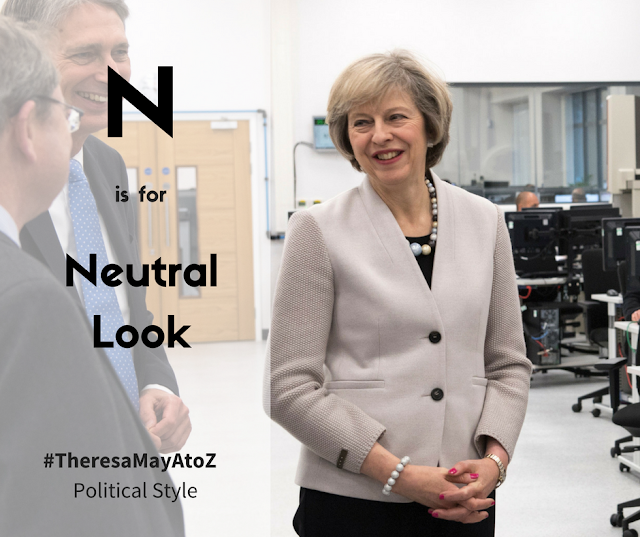 Not content with just wearing neutral garments in the summer months, the PM has an impressive range of taupe, ecru and oatmeal hues in her wardrobe. Think chunky grain blazers, their construction taking their cue from nature’s most natural tones. Tailored, knitted cardigans, perfect to be teamed with a jersey dress or a pair of well-constructed trousers. 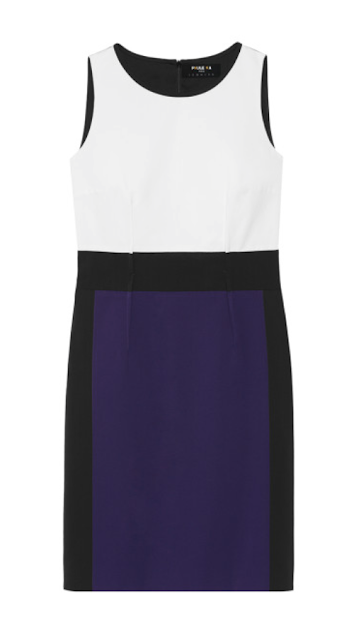 Or a linen dress and matching jacket from Amanda Wakeley- perfect for those hot, sticky summer months in London. May often turns to nature for fashion inspiration. Snakeskin kitten heels from Russell & Bromley and of course, a range of leopard print shoes can all be classed as neutral accessories, working with a cross-wardrobe repertoire. Similarly, May’s jewellery isn’t overly flashy, and like her other pieces, complements her whole look. May’s focus on quality basics, tailored items and simple pieces makes her a great champion of the neutral look. Come back tomorrow for the O is for... reveal! For further A-Z entries and Theresa May posts click here. Nestled in her constituency, the Maidenhead Coop is a hidden gem. Stocking many pieces from quirky small businesses, Theresa May is a staunch supporter of this local cooperative and the entrepreneurs who sell their wares through this location. Interviewed by Peston in Davos in January, we were all intrigued by the glamorous faux fur collar adorning the Prime Minister’s neck. The designer? London based Emilie Lhoste, the brains behind and owner of Louison d’or. Specializing in handmade scarves, bags and accessories, the PM picked up this black, purple and hot orange faux fur collar from the Maidenhead Coop. An affordable price and perfect for keeping warm in the harsh temperatures of Switzerland, May’s choice of collar demonstrated her commitment to small businesses and her love of shopping local. Political Style reader and Maidenhead Mum blogger Jodie recently met the Prime Minister, and presented her with a 2017 calendar full to the brim of photos of her Maidenhead constituency. Thanks to Jodie for these great photos of the Coop and the PM! 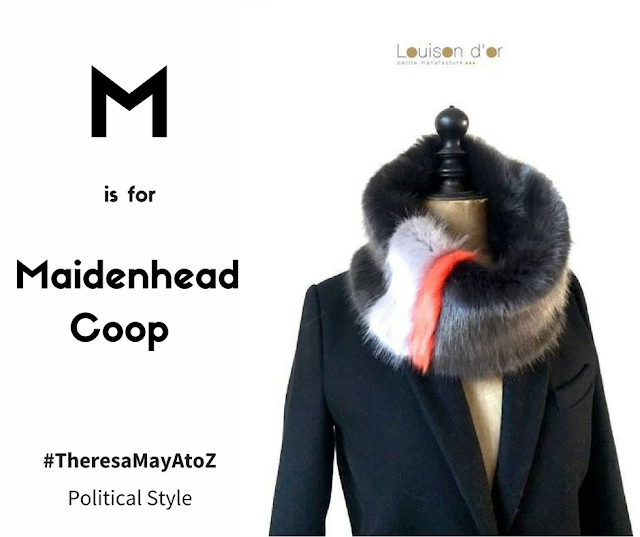 Wearing the scarf brought great publicity for both Louison d’or and the Maidenhead Coop- the question is, which small designers will Theresa May support next?! Come back tomorrow for the N is for... reveal! 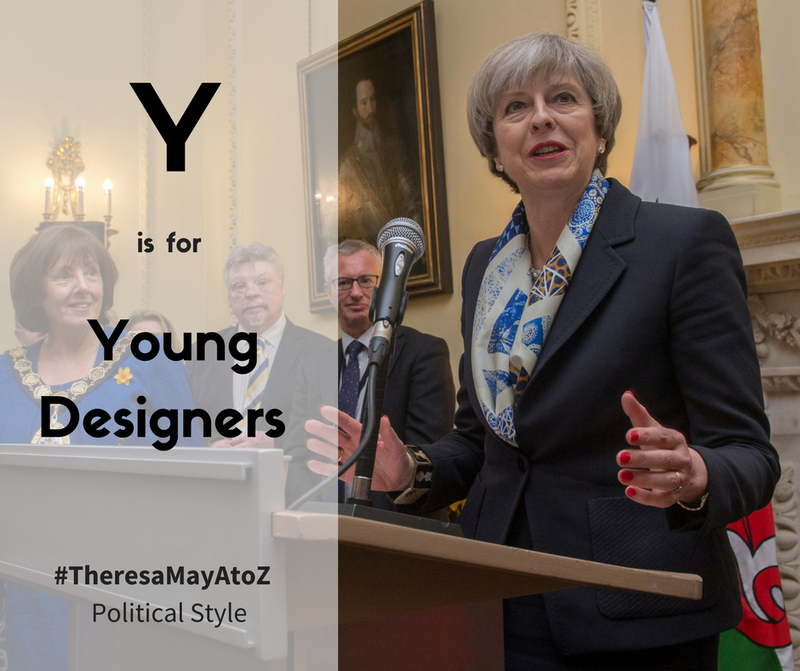 For further A-Z entries and Theresa May posts click here. LK Bennett is a familiar staple in the Prime Minister’s wardrobe. Striding down Downing Street in July 2016, May chose a well worn, and well-loved pair of leopard print Marie Antoinette cut kitten heels for her first speech as the country’s new leader. 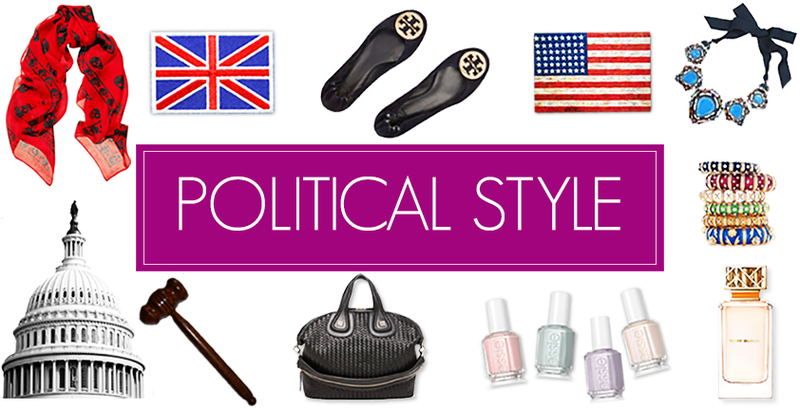 This British brand is a classically cool choice for politicians. Turn on BBC Parliament and you’ll see many female MPs wearing a dress from this high street luxury brand, usually opting for one in a bright shade or an intricate pattern. You’ll see an array of well-cut jackets, and patent heels the colour of the rainbow. 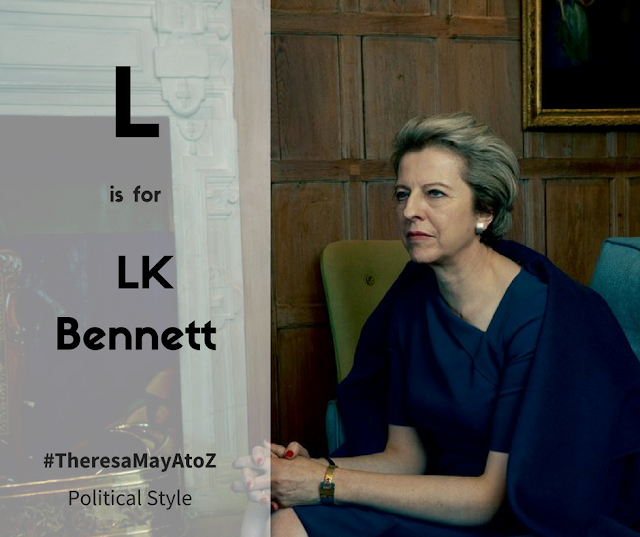 Like her Parliamentary counterparts, May knows she can rely on LK Bennett for a classic staple piece that brings elegance to her wardrobe. Perhaps May’s most famous LK Bennett moment was choosing to wear two pieces in her Annie Leibovitz photoshoot for Vogue. Selecting the navy Fran coat and Saskia dress, May was photographed by Leibovitz in one of the reception rooms at Chequers, the official country residence of the British Prime Minister. It was an achingly cool shot, the strong tailoring of the two LK Bennett pieces making the images timeless and aspirational. Expect to see May wear more LK Bennett pieces, particularly those that flatter and accentuate her tall, slim figure. Amber Rudd, her successor at the Home Office has been seen wearing a few LK Bennett outerwear pieces- no doubt taking inspiration from her very stylish predecessor…! Come back tomorrow for the M is for... reveal! 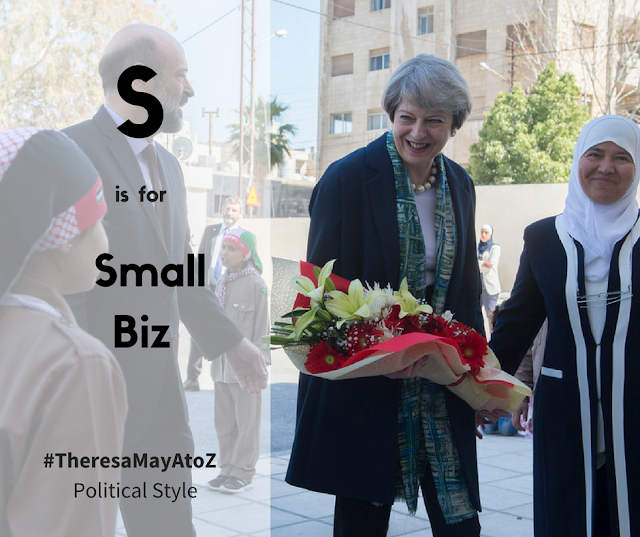 For further A-Z entries and Theresa May posts click here. A strong and stable week on the campaign trail saw Theresa May in all areas of the country. Here's her week in review! 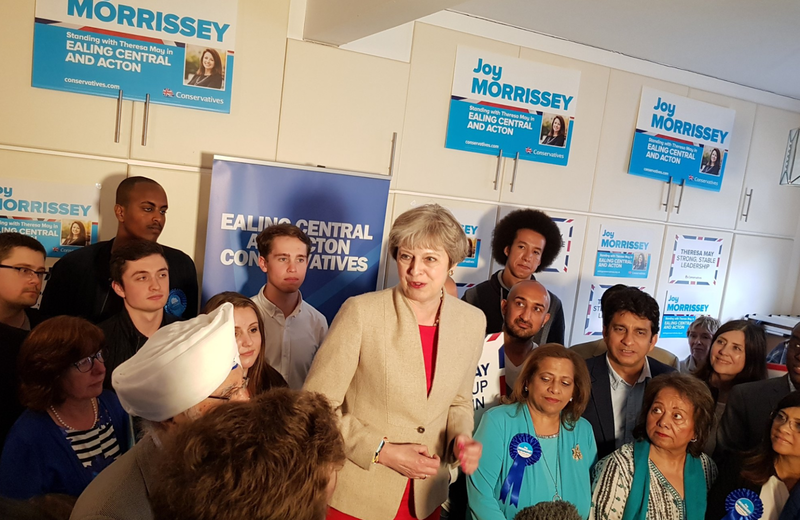 On Monday, the PM was in Harrow, holding an event with candidates and speaking to the press. 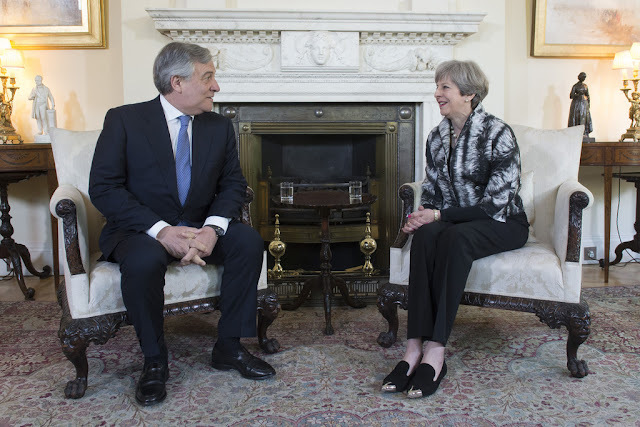 Here May wore a brown tweed woven jacket, black trousers, an oversized Bakelite chain necklace and the Charlize loafers from Russell & Bromley. The PM also visited the National Aviation Academy in Norfolk. On Tuesday, Theresa May was in Yorkshire with candidates and meeting voters. She wore an exact repeat of the outfit she wore to Bridgend two weeks previously- click here for a recap of that event! 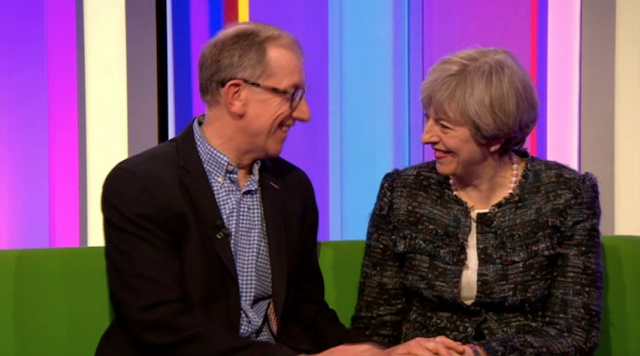 It was then back to London where May appeared on The One Show with her husband Philip. May wore her familiar DvF tweed jacket, black trousers and the Cocktail loafers from Russell & Bromley. Catch up with the great interview below! On Wednesday, May welcomed the General Secretary of NATO to Downing Street. May wore the blackwatch Vivienne Westwood blazer, a white shirt, black trousers and the leopard Frame flats from Russell & Bromley. She accessorised with an oversized plastic chain necklace. 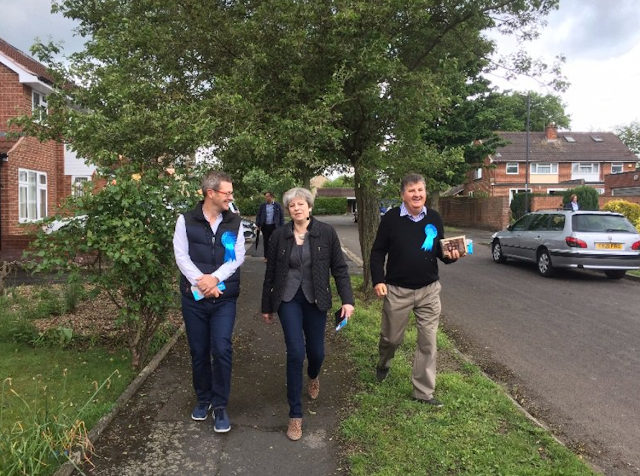 Later in the day, May headed to Scunthorpe, campaigning and meeting local businesses. 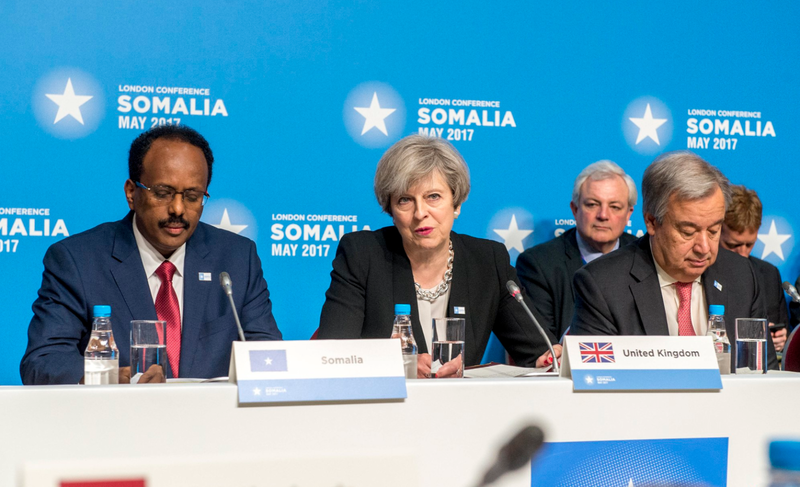 On Thursday, May hosted the Somalia conference at Lancaster House and was joined by Foreign Secretary Boris Johnson. 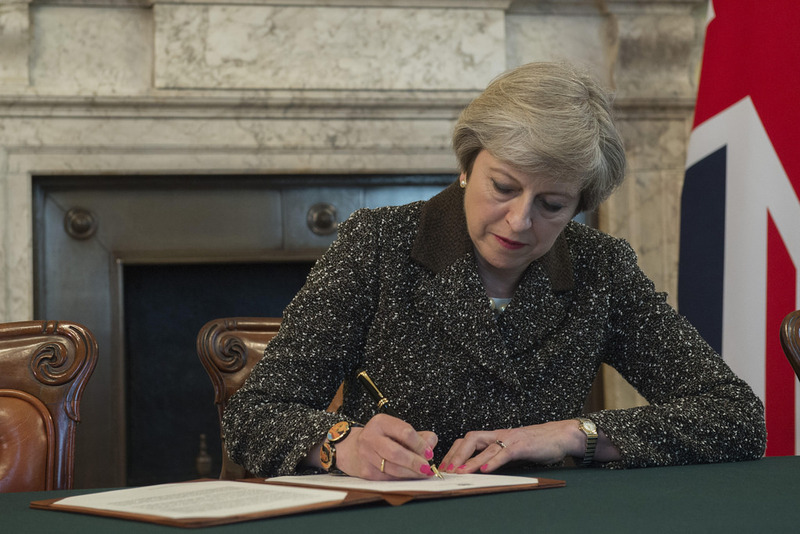 May wore a black suit, white cami and the oversized chunky silver chain necklace and bracelet from Amanda Wakeley. Her shoes were the Divine flats from Russell & Bromley. She also campaigned in Southampton. May also visited a mental health charity in Bermondsey and was interviewed on LBC. On Friday, May launched her battle bus in North Tyneside. Wearing navy and the Cocktail loafers from Russell & Bromley, May accessorised with the crater necklace from Caroline Johnson. And on Saturday, Theresa May was in Northern Ireland. Here she wore a familiar campaigning outfit- jeans, white cami, grey blazer and leopard ankle boots. 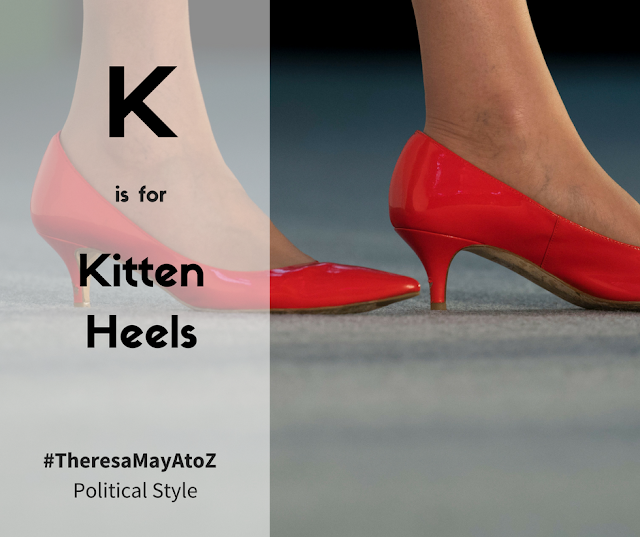 Synonymous with her public image, Theresa May has an extensive collection of kitten heels. 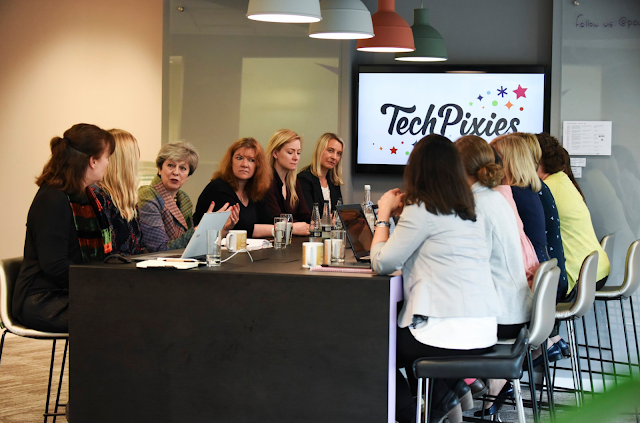 The first thing that many of us associate with the Prime Minister (and absolutely mentioned in every article about her,) kitten heels are a regular choice for May. You only have to trawl back through archive pictures to see what a fan she is- and how over time, her tastes in design have subtly changed. Our favourite and most loved kitten heel has to be the leopard print pair she wore on her maiden speech as Prime Minister on the steps of Number 10. Purchased from LK Bennett, the heel has become synonymous with May’s chic sense of style, and in a recent school visit she named this pair as her absolute favourite. Great minds think alike! May’s other kitten heels include flashes of leopard, and a patent red pair makes regular appearances alongside her red Amanda Wakeley suit and many of her navy workwear sets. 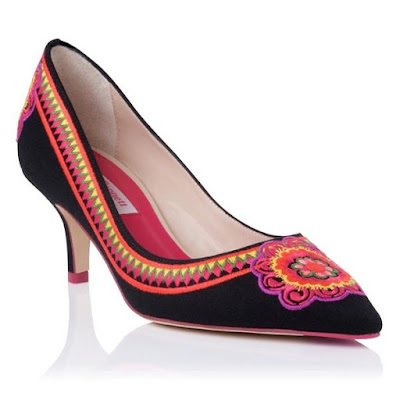 Another chic number is the black kitten heels with detailed neon embroidery from the Issa x LK Bennett collaboration. This is another pair that is hard to source- I’m always on the lookout! Why might Theresa May love her kitten heels? Less painful than a higher shoe, a 2-3 inch heel is the perfect height for May, and they provide the right amount of lift and comfort for a politician who never stands still. Westminster’s hallowed halls (and floors) can prove deadly for tender tootsies – so much so that I used to carry a pair of flats with me when I worked in Parliament. Cobbles and heels are not a good mix! In recent years, the kitten heel seemed to have been replaced by the higher platform shoe, creating a new trend for women to invest in. May’s love of the kitten heel shoes that she won’t abandon something that works well for her, and how she won’t get on board with the latest trend of the moment. Her reasoning is sound, and many retailers have reported higher sales of lower shoes since she took office in July 2016. Keep your eyes open for any new kitten heel deliveries over the coming months- Russell & Bromley has some fantastic new arrivals! Come back tomorrow for the L is for... reveal! 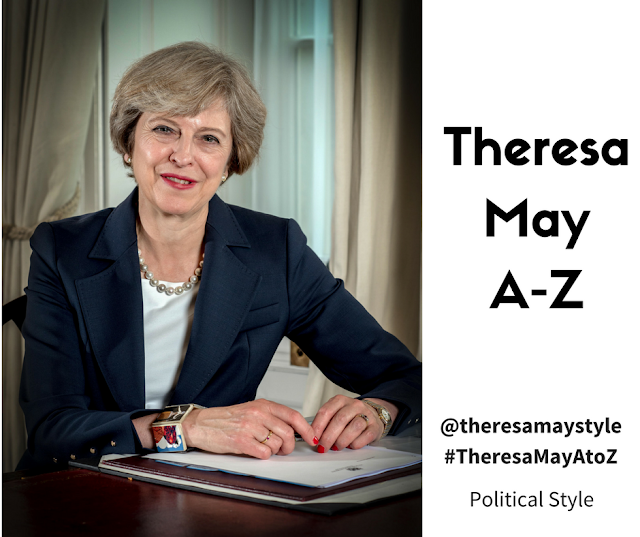 For further A-Z entries and Theresa May posts click here.